Blog of River City Midwifery, a birth center and home birth practice in Richmond, VA. Written by Linsey Kornya. I considered writing this blog post in the form of an Epic Poem. This story has most of the classic Epic elements: A Hero (in this case Heroines) of Legendary Proportions, Adventures of Super Human Strength and Valor (hours staring at incredibly similar items online, hauling massive tubs up and down stairs), a vast setting (China to Richmond and back! ), and multiple sites of action (whats up, Ferguson!). But, alas, this tale does not involve supernatural forces and I’m not sure this poet can remain objective and omniscient, so this is just going to be a regular blog post. Have you ever noticed, tooling around online, looking at birth centers, that an awful lot of them have the sort of garden tub your mom might have had in her bathroom in 1994? Often built in to corners, sometimes with outdated tiling, occasionally involving steps, birth center tubs seemed to us to be a design problem in otherwise beautiful birthing spaces. Every so often you see a freestanding tub, usually appearing, in our browsing, to be way too narrow. These birth center built-ins and narrow tubes are nothing at all like the deep, wide, poofy blow-up birth tubs most homebirth midwives are used to. Our favorite birth tub, the LA Basseine, is a dream of cozy, sturdy functionality. When we set out on this Grand Birth Center Adventure, we naively and offensively assumed these tubs were a failure in taste among our midwife sisters. Perhaps birth center midwives and designers had just not gotten the memo about Beautiful, Round Freestanding Tubs. Perhaps they had forgotten how nice it is during home water births that to be able to reach a client from all sides of the tub. Maybe they’d never watched HGTV? The truth is that we had heard whispered tales about birth tub woes before. Through the grapevine we heard about a hospital labor-tub program where all of the expensive tubs were returned not once, but TWICE. 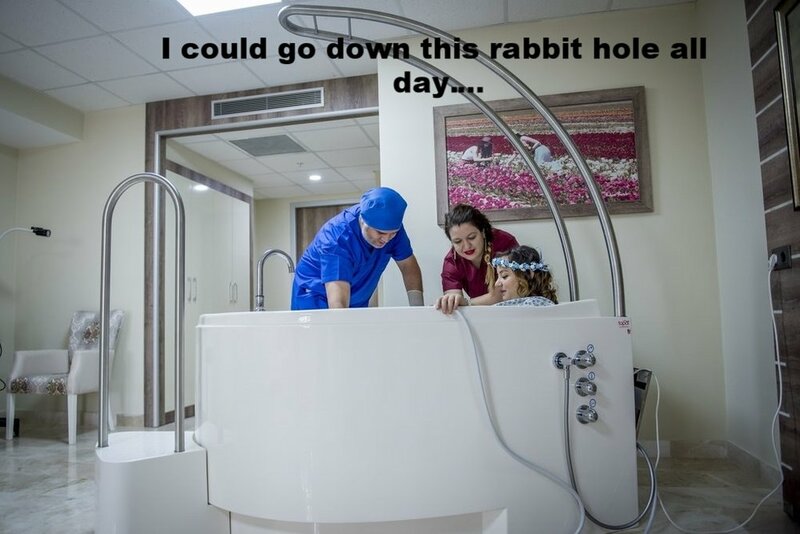 We heard from students who spent hours cleaning jetted tubs after messy water births because, their preceptors told them, they literally had no other tub options. We remembered hearing that tubs were delivered with jets when none were asked for and that plumbing was always, always an issue. Another midwife had mentioned ominously, in passing, “good luck finding a freestanding tub, we tried”. So we were smug then, when a quick search in google, lead us to Wayfair. On Wayfair, there seemed to be a plethora of tubs that appeared perfect for water birth. They looked fine, were strangely affordable, and about the right height and size. We wondered, “have midwives never been to Wayfair before?” We felt worldly and wise, and in the middle of about 49 other renovations, a lake of paint, and the business of starting a new health care business, we didn’t look too carefully at the specs (actually we didn’t know there were specs) and clicked “proceed to checkout”. Our new tub began its journey to us from China. While we waited, we added plumbing to a bedroom where no plumbing was before. To be clear, the amazing and patient Matt at New Day Mechanical installed the plumbing. He worked like a surgeon performing reverse laparoscopic surgery. One small incision in the wall here, another two there, and one to let out the gas over there (there was no actual gas involved). Look inside, thread the plumbing in and voila! The Tub arrived. Adrianna and Marinda muscled and rolled it up the stairs, all by themselves! I was not there, but I imagine they felt very pleased with themselves (and possibly annoyed with me) as they set it in to place. But…….it was not right. Bafflingly shallow. We texted each other pictures of ourselves in various labor positions and declared that “it had to work”. Then we went back to painting a second or third coat on some trim. We had it plumbed in, and it looked beautiful. I posted a picture of the tub (in black and white because the walls were still the color of baby amoxicillin) on Instagram and it was a VERY popular post (for us, I don’t really understand IG). Okay, we thought, the tub is good. It has to work. Paint trim, rip out flooring, imagine that all future clients will be 4’11”. That night, I took a bath in it. You guys. It was AWFUL, and I wasn’t even remotely in labor. Hard, slippery, so, so shallow. The combination of shallowness and largeness made it feel like I was just sitting naked on the floor in a vast puddle, which, well, I was. The hard and narrow sides hit a strange part of my back and leaning over the edge in hands and knees - the most common water labor position - was a comedy of errors and bruising. Another time, my toddler had a great bath in it. He declared it a “Great BIG BIG pool-bath!”. So there you have it. Thumbs-up from the under 3 set. It was with great sadness that the three of us convened the next morning and admitted to ourselves and each other that it had to go. We had thirty days to return it. This seemed like a reasonable list. We learned more about bathtubs than we ever imagined was possible to know. We learned that the Standard Depth of a tub in the USA is 14-17 inches. This, of course, is too shallow for anyone who is not a baby. We learned that a “European depth” is 18 inches and that “Japanese or Greek depth” was 22 or more inches. We studied websites and we learned the listed measurements were often wrong. So, we downloaded and studied the specs. Now, we understand that people not concerned about humans emerging from bodies might not have the same sense of urgency over these few inches, but it was frustrating how difficult it was to determine “how deep is the tub”. 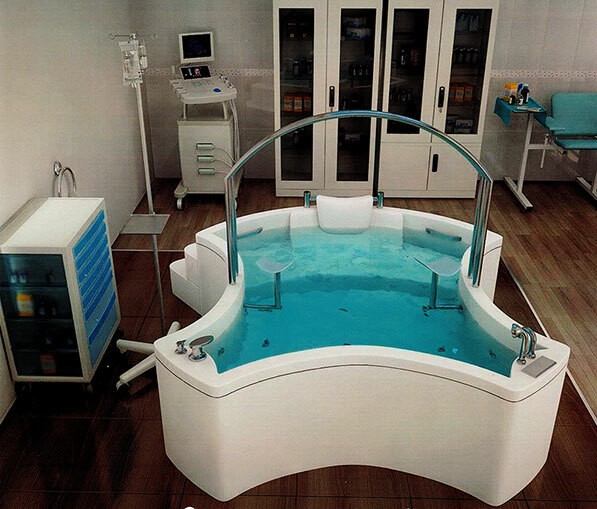 You guys, there are thousands of freestanding tubs on the market. Who knew? They are mostly variations on the theme of “Banana Split Boat”. Or sometimes they are shaped like shoes or horse troughs. We kept searching. Japanese soaking tubs, we learned, were deep and round, but far too narrow for baby having. Like big buckets. We learned that those Friends-era built in garden tubs, usually jetted, offered the best depth, but we couldn’t and didn’t want to tile a tub in to the simple little 1930s bedroom that we loved. And NO JETS EWWW. So we looked, and looked. Late at night, loopy, I even tossed hilarious hospital birth tubs like this in to the ring. Some of them are actually pretty cool, but mostly not available in the US (of course) or hospital-budget friendly not low-debt birth center budget friendly. I mean, this could be cool. I’ve always wanted to be a spaceship pilot! We did find one tub that was kind of perfect. I present to you: The Aquatica Pamela. She wasn’t the prettiest tub at the prom, but she fit every single criteria. Except one. She wouldn’t fit in the birth center, up the stairs or in the room. We contemplated removing doors, windows, trim, hiring a crane, and/or changing the entire layout of the birth center. She was also way out of budget. So we got special tub financing. However, before clicking “buy now”, this time, like a pack of geniuses who learn from their mistakes, we made a template from an old sheet and laid it in the room. No. No way. Way too big. Would be like a cereal bowl in a dollhouse. We vowed to get Pamela for our next birth suite, because in all other ways, she is kind of perfect. At least we won’t have to go through this again in a few months. Finally, in an act of desperation we did what countless people before 2017 have done. We went to a store. Now, I had been to another Ferguson the previous week and found a tub that would more or less work, but it wasn’t perfect. Let’s call this tub “Barnabus”. Here, my husband and child demonstrate “how to make showroom workers uncomfortable”. At the time, convinced there was a perfect option, we dismissed Barnabus out of hand. Back at Ferguson, this time, we scoured not just the internet but the dark web of shopping: industry catalogs. We learned about the world of Very Expensive Tubs which included copper (the metal) and Solid Surface (the rock) and other rare elements. We added “must not weigh more than 300 pounds” to our list. Armed with The List and a mountain of catalogs, Marinda and our wonderful sales worker Teresa McClellan, found us a short list of acceptable, or nearly acceptable, candidates. With names like “Olivia”, “Elise” and “Adriann”, they were fancy versions of the banana split boat. Mostly they were too narrow, too heavy, and had a several week wait time. And were over five thousand dollars. Back to the Aquatica Pamela? We did some more measuring and contemplated our life choices. Maybe we could make it work. MAYBE IF WE GAVE UP AND STARTED FROM SCRATCH. Did we all cry? I’m not saying. Enter, stage left. Barnabus. In a sea of almost-right Olivias and Pamelas, we had looked right past the almost-right Barnabus. There he was on my photo roll, comfortably accommodating a giant adult human and a small 10yo. His edges were wide enough to lean over, he was deep enough. He looked alright. When he arrived from across town, we visited him at the Fergeson showroom. He was good. A little underwhelming among all the shiny copper pennies and cold, hard rocks, but we took him home. (I mean, some strong workers brought him to the birth center). I have to say, he looks great! So deep and cozy, lovely, freestanding. We can get to all sides, he fit in the door. Now, we just have to get Matt here to move the drain over three inches…. Stay tuned for reports on Barnabas in action! We would love to hear from you. Use our Contact Form to set up a free consultation and tour! We will get back to you right away. You can also visit us on Facebook or Instagram or stop by the new birth center and visit us in real life!